What have they done to the rain? Chemist Thomas N. Scortia (1926–1986) published science fiction from the 1950s to his death from leukemia; he was nominated for the Nebula in 1966. His frequent writing partner, Frank M. Robinson (1926–2014), was active in SF from the 1950s to his death. His awards and nominations range from the Hugo to the BFA, from the Lambda to the Locus. Robinson was also a well known activist. Together the pair were masters of the disaster thriller. 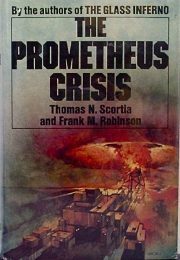 Their 1975 standalone The Prometheus Crisis is a fine example of their work in this genre.